A special night out on the town requires more than just your average food fare. It takes a “Fine Dining” experience composed of select foods, the right décor and perfect lighting. Join host William Grimes as he uncovers the stories of how these small, exclusive, elegant and elite restaurants found a home in New York City. Explore one of the oldest fine dining establishments in the City. Then visit with the talented team behind the groundbreaking 11 Madison Park. I’ll be making one of Delmonico’s most famous desserts, originally known as “Alaska, Florida.” This is the last episode of the season! Tonight @ 8:30 on NYC LIFE. I know I’ve been behind getting the full episodes up on my blog; I’ll catch up next week! Going Vegan Day 5: A Vegan Feast! I kept breakfast and lunch simple today: oatmeal with soy milk in the morning; almond butter on coconut bread with banana slices for lunch. The coconut bread was really tasty, and also a throwback to the 1910 cookbook. Cocoanut Bread — 1 lb. whole wheat flour, 1 lb. white flour, ½ lb. cocoanut meal, some cane sugar. 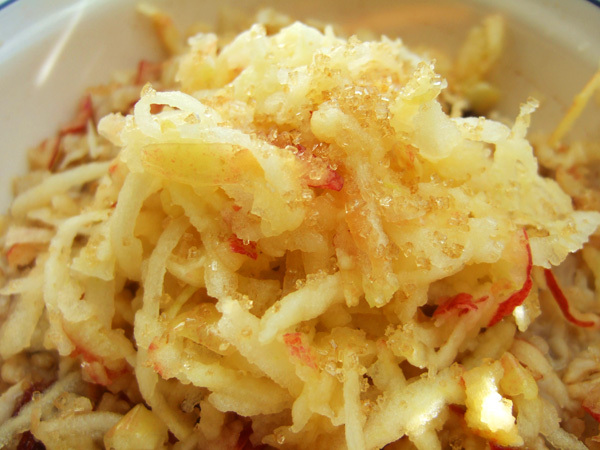 I used 1 cup of cane sugar for this recipe, and the coconut shreds I used were also sweetened. I also added 1 tsp of baking powder. The bread was delicious! Shaved Cabbage, Grated Beets and Apples, Mint, Lemon Juice and Toasted Walnuts. 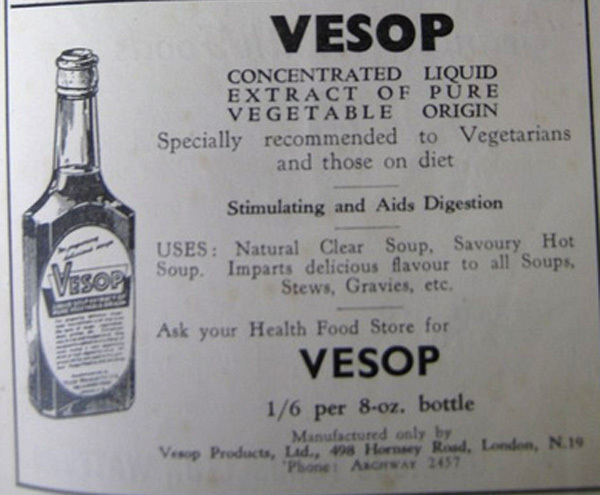 The first course was another salad recommended in Henderson’s 1945 book. It was light, refreshing, and delicious. The second course was the Semolina Soup I made earlier this week, flavored with Marmite. Everyone was bowled over by the soup, and wanted the recipe to make it at home. I passed around the Marmite jar for everyone to ogle. 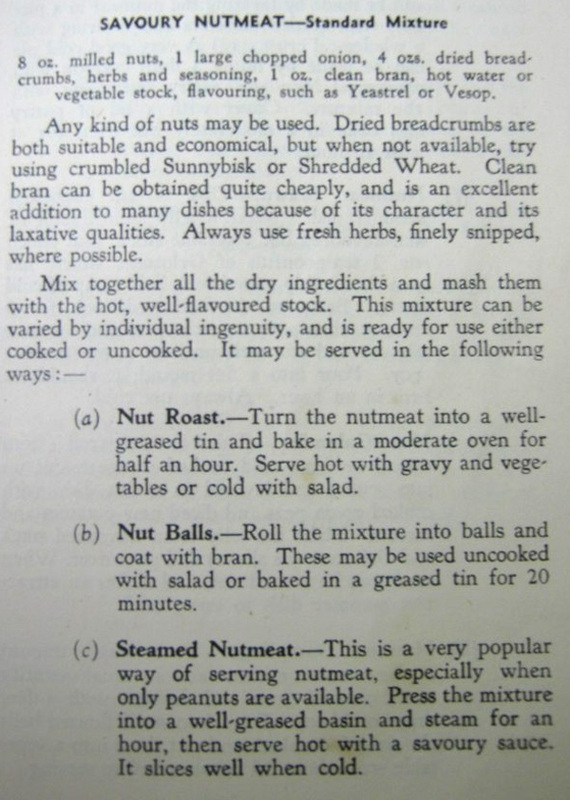 The third course was Nut Roast, adapted from the 1910 recipe I made earlier this week, with some adjustments according to Henderson’s 1945 recipe. 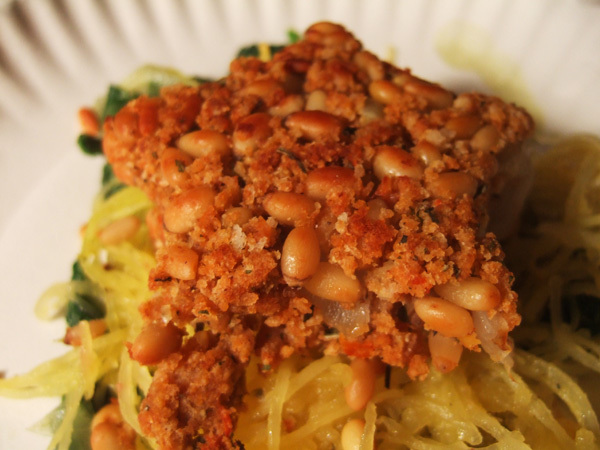 Henderson gives several suggestions as to how her basic recipe can be served; I roasted mine in individual portions, and served it on top of spinach and spaghetti squash. When I mixed this recipe, I simply put a bowl on top of my kitchen scale. I dumped the ingredients in one at a time and weighed as I went along. Below, is my adapted version of the recipe. I used dried herbs from my mother’s garden. 8 oz pine nuts, coarsely chopped if large. 4 medium tomatoes, skinned and pulverized. 1. Use hands to mix all ingredients, added a little water or vegetable stock if there is not enough liquid. Press into a pie plate or individual ramekins. Bake at 375 degrees for 20 minutes, or until the top is browned. The nut roasts, cooked in individual star-shaped ramekins, delighted my guests. For the vegans, it was the first time they had ever had a nut roast, and were excited to try it. One guest, who went to school in Scotland, informed us that nut roasts are still a common vegetarian option, at least in her school cafeteria. 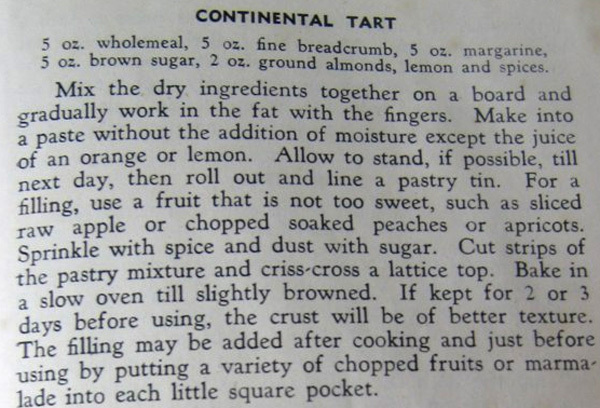 And for dessert, I served an apple Continental Tart, also from Henderson’s book. 1/2 tsp fresh ground nutmeg. 1. Combine all ingredients in a bowl, adding enough lemon juice to make a dough. Leave overnight in the refrigerator, then press into the bottom and sides of a round cake or pie pan. Bake at 375 degrees for 15-20 minutes, until crust is puffy and brown. 2. In the meantime, pare and core apples, and slice them into 1/4 wide slices. 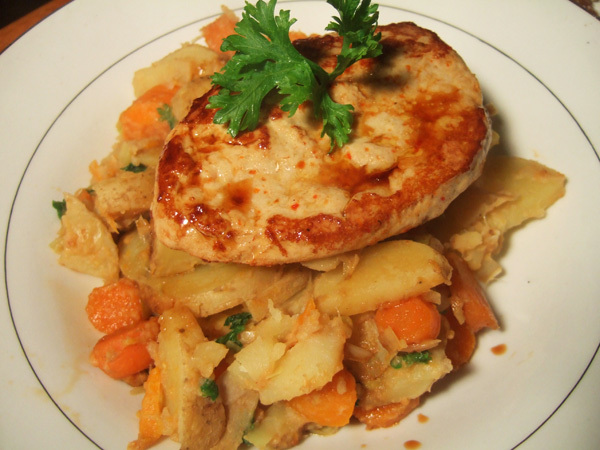 Cook, covered, over medium heat with spices, fruit and cider until tender. Pour into baked crust and set aside. 3. 15 minutes before serving, place tart in the oven at 375 degrees for 10 minutes. Allow to cool 5 minutes; cut and serve. We had a second dessert of slices of coconut bread, spread with some of my mother’s homemade jam (Blueberry Lime and Blackberry) or dribbles of malt syrup, which the vegans had never heard of before and were very enthusiastic about. We talked about the difficulties of finding vegan products: for example, learned that filtered wine is not vegan; it uses isinglass, an extract from the swim bladders of fishes. Animal products appear in the most unlikely of places. We cheersed, and spent the rest of the evening guzzling bottles of wine. The next day, my boyfriend and I broke our vegan fast in the evening with sloppy joes and chocolate chip cookies. There is a lot of debate, and a lot of passion, surrounding the topic of veganism. I’ve enjoyed this past week, but I would not adopt veganism forever. My line of work is food and I feel I would never want to limit myself in regards to what I can and cannot eat. Additionally, I do believe an ethical, omnivorous diet is possible. I will continue to respect and admire my vegan friends, and this project has inspired other to try out veganism: my friends Sharon and Kathy are going vegan this week, you can follow their adventures here. I think I’m going to leave it at that, but I’m really curious to hear from you, dear readers: What do you think of veganism? Today I moved from 1910 to 1945, the year that the first cookbook to use the word “vegan” was published: Vegan Recipes. This book is tremendously hard to find; in the day and age of the Internet, one thinks anything can be found online. Google books: nothing. New York Public Library archives: the books was stolen in 1952. Vegan Recipes to not seem to exists in a hard copy or otherwise anywhere in America. Eventually, I had to write London, where the book was originally published, and after some rigmarole I tracked down a copy. I’m hoping that one day soon the book will be available online, as it is such an important work in terms of culinary history. The author, Ms. Fay K. Henderson, write an introduction to veganism that focuses less on the threat of disease and more about “being healthy.” She moves to the more familiar ground of moral and ethical considerations, and uses a lot of words like “wholesome,” when describing what she calls “The Vegan Way of Life.” I had been looking forward to cooking from her book; the recipes seemed more like real dishes, with layers of flavor. Breakfast, however, was a disaster. 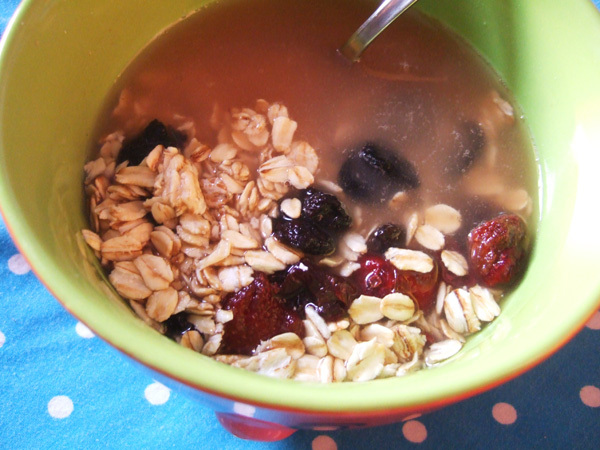 I decided to make muesli. 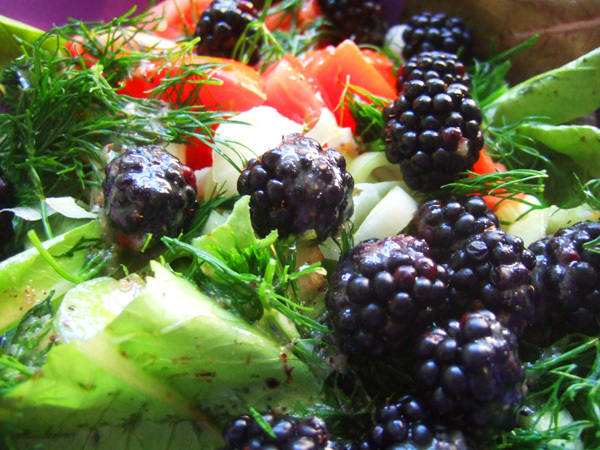 According to Henderson, “This raw diet dish originated by Dr. Bircher-Benner and recommended for breakfast use. It consists of whole cereals (crushed or flaked) which have been soaked fro 12 hours in water to which has been added some sweetening and a little lemon juice, when available.” I used something slightly better than water, that Henderson recommended, called Apple Broth: the peels and cores of apples, simmered gently in water. The result is a pale pink, slightly sweet broth with a distinct apple taste. Interesting idea. I soaked some rolled outs, added some dried fruit, and shoved a heaping spoonful into my maw. Disgusting. Cold. Gooshy. Miserable. A fairly sad way to start my day. I ate out the fruit and dumped the rest. I spent most of Thursday running: work in the morning, a meeting in the afternoon, a lecture in the evening. In between, I ducked into a coffee shop to finish writing my talk, and I realized I needed to eat something. I perused the cafe’s sandwich list and approached the register. “Okay, give me an ice tea and a veggies sandwich.” The barista typed in my order. “No! 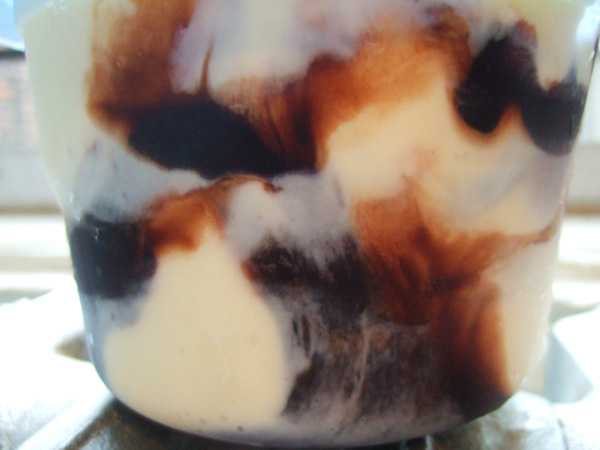 Wait…it’s got cream cheese. Okay, give me a peanut butter, banana, and honey sandwich.” Type, type, type. She must have thought I was crazy. I apologized profusely, and ended up with a peanut butter and banana sandwich with blueberry compote. Really tasty. Afterwards, I swung by home to make some cookies for the lecture I was giving in the evening, a talk at the Brooklyn Historical Society about using historic recipes to inspire contemporary cooking. The cookies were a new recipe I was testing, and they were packed full of butter. But I needed to try one to make sure it tasted right. Butter, right into my mouth. Or any other assortment of root vegetable, chopped. 1. Fill a pot with two cups of water and a little salt. Add vegetables, cover, and boil about 10 minutes or until tender. 2. Drain liquid and add soy sauce, pepper, and parsley. Still until parsley is just wilted. 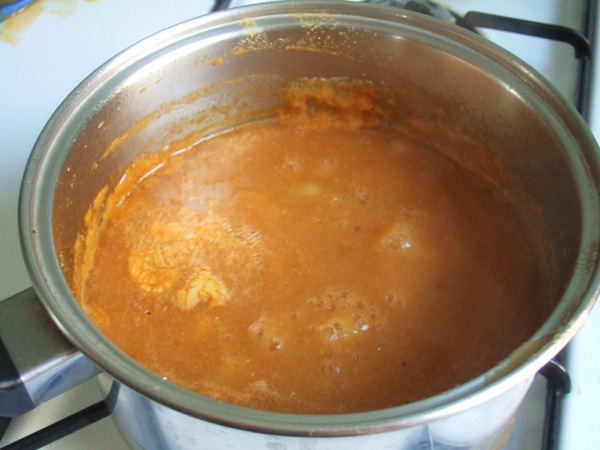 Add peanut butter; stir until peanut butter is melted and vegetables are evenly covered with sauce. 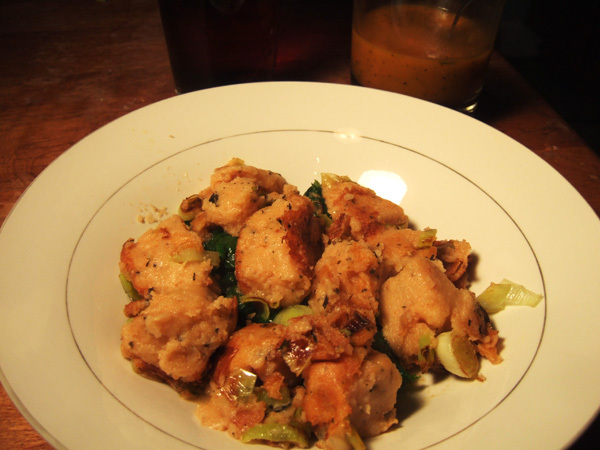 Serve with fake meat and more soy sauce, if desired. 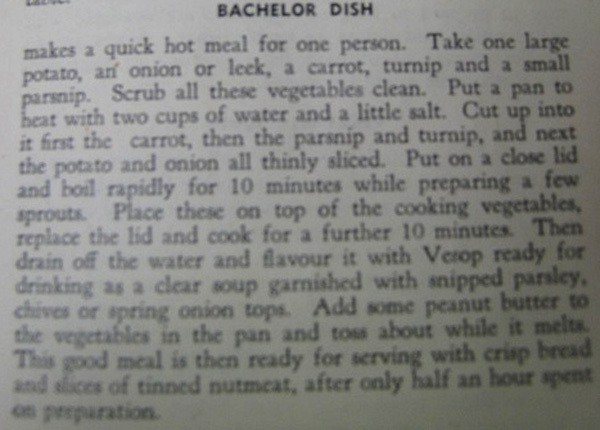 Bachelor Dish – quick boiled veggies in a peanut sauce with a bit of “tinned nut meat.” A wonderful dinner! Today was hard; this has been the most difficult diet to stick to. Not out of hunger, or out of a craving for other foods, but it is incredibly difficult to seek out foods that don’t have animal products in them. I’m developing a sympathy for people who have chosen this way of life; it’s exceptionally hard to maintain. Semolina Soup. I know; it doesn’t look like much. It left it on the stove for my boyfriend to warm up at lunch, and he threw it away because he thought it had gone bad. Nope, that’s just the way it looks. My day began simply with leftover apple bread and hot tea with almond milk. Almond milk, by the way, has been around a long time: there are recipes for it in medieval manuscripts. I had to go to work, so I made my lunch in advance: Semolina Soup. Although “Vigar Gravy Essence” seems to have fallen by the wayside, I knew Marmite was still around (What is Marmite? Read up here). I had given it a whirl a few years ago when handed a sandwich from a friend who has a penchant for such things. I’ll try anything once, and after the first bite, I found it inexplicably enjoyable. I was curious how it would taste as a soup flavoring. 1. In a saucepan, sautee the onions in olive oil until brown. Add pepper and a little salt. Add broth and water, bring to a low boil. The liquid should be just bubbling. 2. Slowly add the semolina flour, stirring constantly. I like to use a sifter to ensure a soft, steady stream of flour, which will prevent gummy lumps from forming. 3. Cook, stirring occasionally, until the porridge has thickened to your taste. And that’s all! It was ready in about 20 minutes. But it smelled really unappealing while I was cooking it. Perhaps it was too early in the morning? Perhaps the order was mingling with my freshly toothpasted mouth? I packed it in a thermos and took it to work. At lunchtime, I busted it out, still warm in my thermos. And it was delicious! It was so good, I made my coworker drink some, and she liked it too! The Marmite tasted meaty, as though the soup had been made with a beef broth. It was remarkably like french onion soup: warm, filling, comforting; it made me think of fall days. I’m planning a vegan dinner party for Saturday, and I’m thinking of serving this as the first course, perhaps with some greens stewed up in it, and a crunchy crouton made with apple bread. 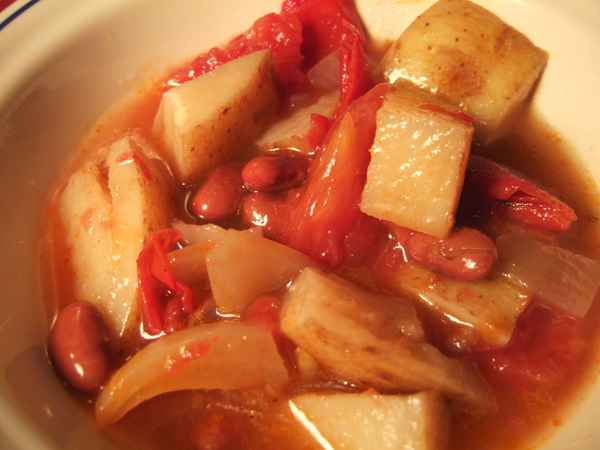 Mexican Stew — 1 cupful brown beans, 2 onions, 2 potatoes, 4 tomatoes, 1 oz. sugar, 1 cupful red grape-juice, rind of 1 lemon, water. Soak beans overnight; chop vegetables in chunks; boil all ingredients together 1 hour. Again, I was attracted by the unique flavor: grape juice as a soup base? And what does that have to do with Mexico? The final verdict from both my boyfriend and I was that it “tasted like soup.” Good, but unremarkable. The grape juice flavor wasn’t prominent, but it had a concord grape aftertaste I found unappealing. 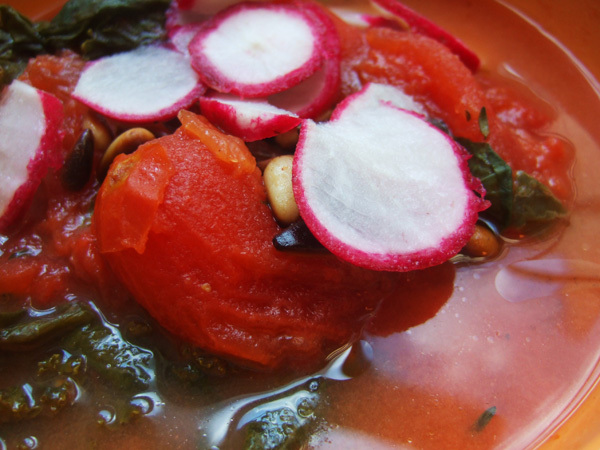 My first foray in to vegan cookery: Tomato, kale, and spinach soup with toasted pine nuts and raw radishes. Spinach Soup No. 1 lb. spinach, 1 lb. can tomatoes, 1 tablespoonful nut-milk (Mapleton’s), 1½ pints water. Dissolve nut-milk in little water, cook all ingredients together in double-boiler for 1½ hours, strain and serve. Most of the recipes in the book are equally plain. At the risk of sounding sexist, this book was written by a man. In 1910. Who was a vegan. He’s not the first person I would turn to for culinary advice; his collection of recipes are more like instructions on how to make something to eat than recipes for a meal. I wrestled with how much I would allow myself to alter the recipes without losing their historic nature. In the end, here’s what I I did: I added kale in addition to the spinach and two teaspoons of fresh herbs as well as pepper and salt. I don’t know what “Mapleton’s Nut Milk” is, I think some powder to mix with water, so I used about 1/4 cup of almond milk. I did cook this in a slap-dash double boiler, a glass bowl set in a stock pot, and in 90 minutes it was tender and soup like. To add some texture, I toasted pine nuts and added a few slices of fresh radishes. I feel like maybe I diverged from the initial recipe too much, although I used ingredients that would have been on hand in the average 1910 vegan household. In the end, it tasted ok. My boyfriend and I ate big bowls with slices of toast, and it was fine. Not bad; not great either. Apple Bread 2 lbs. entire wheat meal doughed with 1 lb. apples, cooked in water to a pulp…prepared as follows: Mix ingredients with water into stiff dough; knead well, mould, place in bread tins, and bake in slack oven for from 1½ to 2½ hours (or weigh off dough into ½ lb. pieces, mould into flat loaves, place on flat tin, cut across diagonally with sharp knife and bake about 1½ hours). 1. Pare and core the apples; cube. Put into a pot with a little water, and cook over medium heat until soft enough to mush to a pulp. Feel free to use different types of baking apples, some that stay solid and some that fall apart into sauce, to add different textures. 2. Add almond milk to hot apples and stir. Sift together whole wheat flour and baking powder, add to apple mixture. Press into a loaf pan and bake 45 minutes at 375 degrees, or until done. 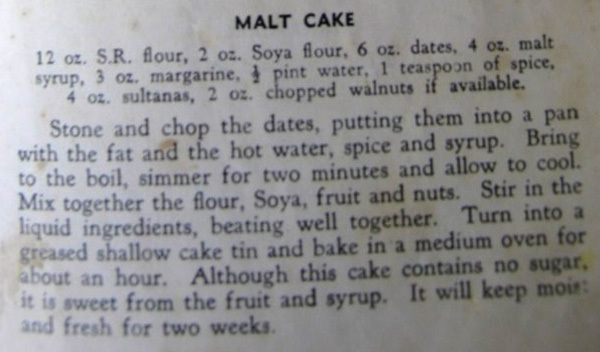 Nut Roast No. 1 1 lb. pine kernels (flaked), 4 tablespoonfuls pure olive oil, 2 breakfastcupfuls breadcrumbs, ½ lb. tomatoes (peeled and mashed). 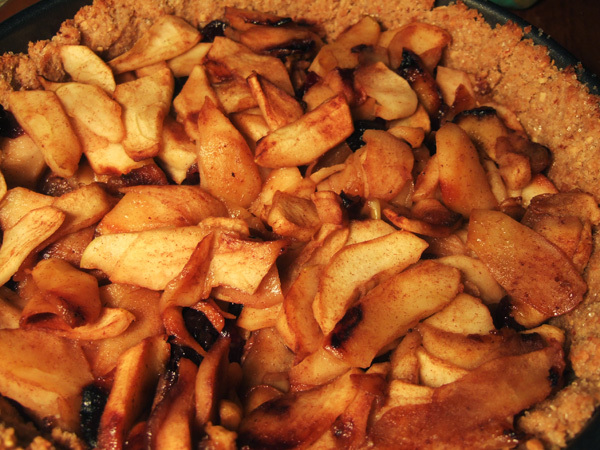 Mix ingredients together, place in pie-dish, sprinkle with breadcrumbs, and bake until well browned. I coarsely chopped pine nuts which added a nice texture; I didn’t have plain bread crumbs, so I used “Italian Spice” bread crumbs, which were delicious. The tomatoes, which I mashed until chunky, were nice bright spots of acidity. Basically, I threw all three of the above dishes into a 375-400 degree oven at various times, and an hour later, I had dinner. Dinner: Brown! 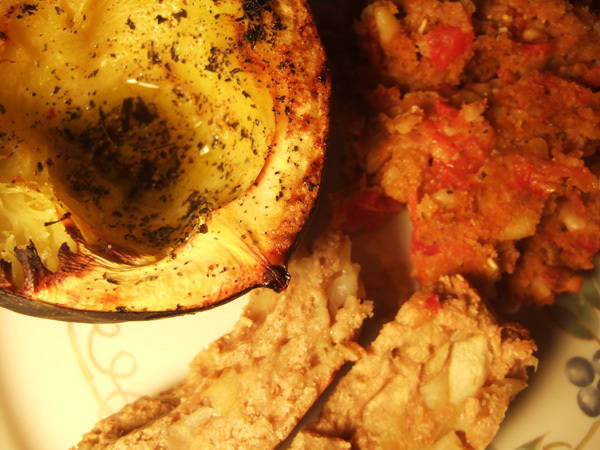 Roasted squash, nut roast, and apple bread. My boyfriend, a voracious carnivore, dug into dinner with enthusiasm. 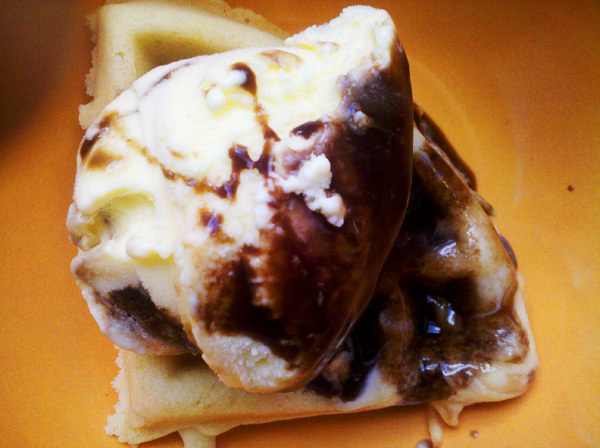 “This is delicious! It tastes like fall! Being vegan is great!” Those are actual, direct quotes. And I’d have to agree: dinner was really, really good, and very satisfying. For dessert, we had baked bananas. Weird looking, and tasted about how you’d imagine: like a hot soft banana. 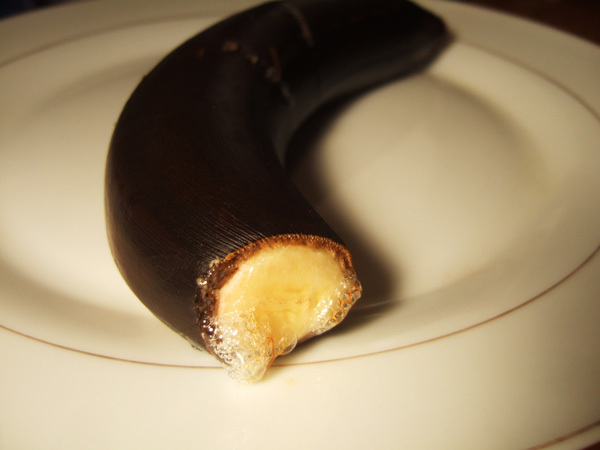 Baked Bananas- Prepare the desired number by washing and cutting off stalk, but do not peel. Bake in oven 20 minutes, then serve. It’s not until after dinner, when I was cleaning up, that I thought to double check the ingredients on the “Italian Bread Crumbs.” I was horrified to discover it contained honey, skim milk, and buttermilk. Crap. So I messed up day one of veganism; but overall, the food was not bad at all.